It is clear that the Montessori education model is educationally enriching for children in terms of the effective pedagogies underlying the model. 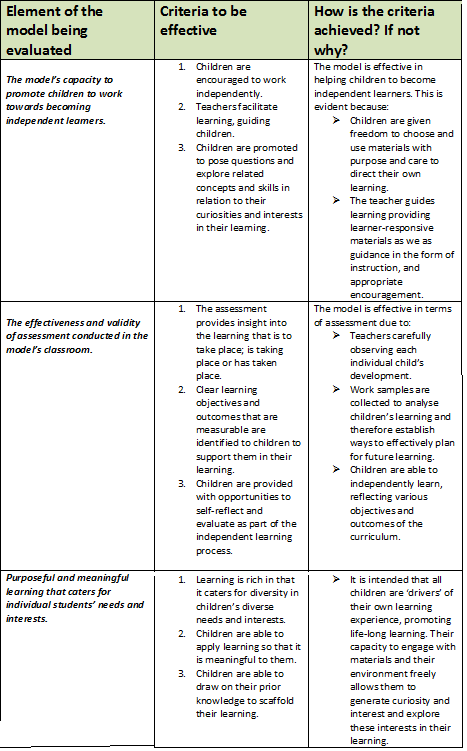 The below table (Figure 1.1) evaluates a number of elements within the Montessori model, against a specific criteria followed by providing evidence to show how the criteria is reflected within the model. ABOVE: Figure 1.1 showing elements of the Montessori model evaluated against a specific criteria. Figure 1.1 above illustrates a concise evaluation of the Montessori Educational Model. One particular aspect that reflects effective pedagogy is that of learning being tailored to suit the needs and interests of individual students. This is invaluable within learning experiences as children are promoted to freely engage with their learning; therefore being more likely to gain more comprehensive understandings. It appears that children are 'able to make sense of their world' (Roopnarine & Johnson, 2005, p. 234) by actively engaging in this educational model due to the strong emphasis on student- centred learning and the freedom in which children are given to explore and discover aspects of their own learn that are of interest to them. Overall, the Montessori Educational Model is effective in that it promotes student- centered, teacher facilitated learning where all children are encouraged to explore aspects of their learning that interest them and that relate to their curiosities.